What Kind of Book Best Describes You? Hello! Hello! Hello! We are so sorry we have been absent for two months but we are back in action and ready for the Holiday season! Back in the beginning of the semester I (Sarah) was asked by one of my professors “What kind of book best describes you?” in a “get to know me” intake for the whole class, and I thought it would be fun to elaborate more and of course let Amanda join in on answering this out-of-the-box question as well. Question: What kind of book best describes you? S’s Answer: The type of book that best reflects who I am would probably be a coloring book. I identify with bright colors, having creative freedom, and feeling satisfaction after I complete something to the best of my ability. I wouldn’t describe myself as a novel because sometimes most times I have difficulty using my words. I’m not great at sitting still for long periods of time and I am most definitely not one who has every punctuation mark placed perfectly in their lives. I prefer being childlike over being professional. I can be naive and slightly gullible at times but I hold on strongly to my creative abilities and sense of originality. Outlines give me just the right amount of structure while open spaces allow me freedom to create something new. I enjoy being able to make my own choices by picking what colors go where and knowing that no one will ever be able to create the same masterpiece that I am etching up. Sunny days are my sanctuary and my taste buds always crave fruity flavors. I listen to my music a little too loud and my eyes are widest when I see the splendor of a West Texas sunset that my Illustrator perfectly paints each evening. I’m a 10 year old trapped in a world telling me to grow up already, unwilling to turn my doodles into resumes. I trade in early bedtimes for late night adventures of taking study breaks to go play with friends’ new puppies, roaming Jones stadium after hours to take in the calm before Saturday’s storm, and going on Broadway crawls that end with bare-feet-jumping-around-on-kitchen-tile dance parties. I’m not one to expose my whole self by being an open book placed on a shelf for a curious costumer. I gravitate towards the privacy of my own refrigerator with only a select viewing audience of close family and friends. I think it’s very important to leave your mark on something so I don’t mind switching up the pace or adding my own twist to things that have already been done before. I use my 24 pack of fine point sharpies to scribble out packing lists, frantically post reminders, and boldly print due dates, because black ball point pens only leave left-handed smudges, and who wants to be described as a giant smudge or a misprint?… I try not let my age define my state of being or let urgency and post-grad plans rob my sense of color. Plus, who am I to alter the design of what The Ultimate Artist perfectly drew up and hand crafted. A’s Answer: I think the type of book that would best describe me would be a 2015 Kate Spade Planner. There is just something about writing down all of my tasks, events, and deadlines on a piece of paper that makes me feel excited. Sure, I have my calendar on my iPhone and my electronic calendar at work, but it isn’t the same. Call me “old school” I guess, but nothing beats out a trust planner that I can hold in my hand. I guess you could say that a planner technically isn’t a book, but the way I look at it is that a planner is a book about you. You could almost say it is your autobiography. Now it may not be filled with eloquent sentences and perfectly fitting adjectives, but it truly represents who you are. I believe you can really tell a lot about someone by what their planner looks like. For instance, are you the type of person who buys a planner, spends all day writing things down and never looks at it again? Or are you the type of person to include motivational quotes and verses on the days that you know will be tough to get through? Your planner perfectly describes you without even trying. 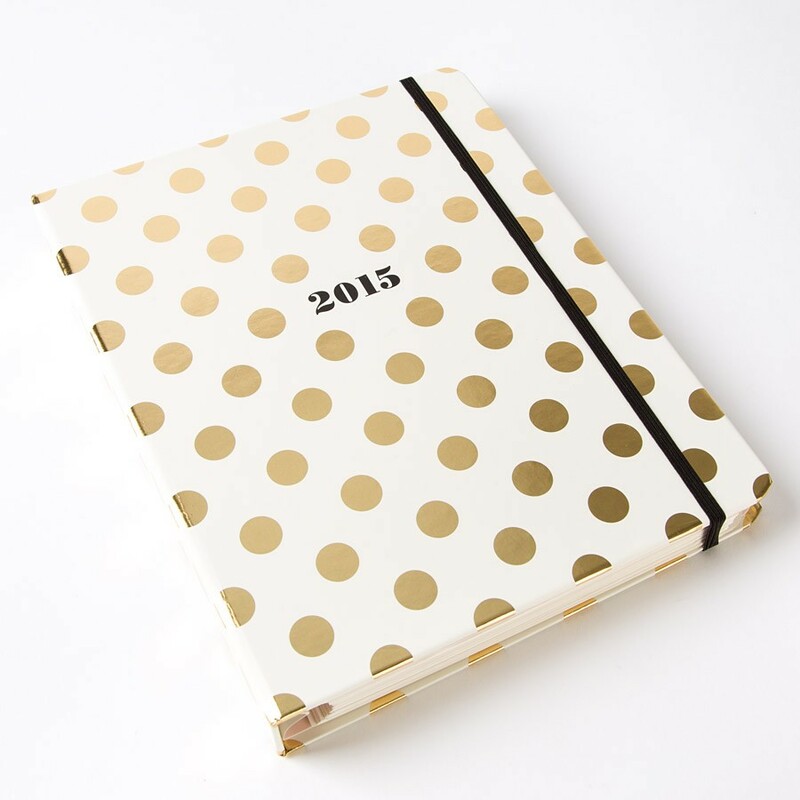 Now you might be wondering, why a 2015 Kate Spade planner in particularly? Well I purchased this beauty just a few months ago and I am in love. The simplistic, classy, and fun design fits my personality to a t! If you are in the market for a new planner to get your new year started out right, you definitely need to look into this beauty! I purchased mine at Dillard’s for $36.